It seems that some registered Scopus users have received an email (similar to the example shown below) in which they are asked to login to their account and change their password or else his/her account will be deactivated. Caution: This is a Phishing email. The link in the email goes to a ‘scopus.110mb.com’ link and not to Scopus.com. Do not click on the link and delete the email from your inbox. In case you have any questions, please contact your regional helpdesk. In mid-2013 Scopus launched the Books Expansion Project to increase the Arts and Humanities content in Scopus and the project has been steadily moving along. To date, you can see more than 40,000 books in Scopus! How is the program going? Books from more than 30 major publishers such as Springer, Wiley-Blackwell, Elsevier, Brill, Walter de Gruyter, Princeton University Press, Palgrave Macmillan and Project Muse have already been selected and are being processed. More than 40,000 books have now been loaded in Scopus and we expect to have at least 65,000 books in Scopus by the end of this year. 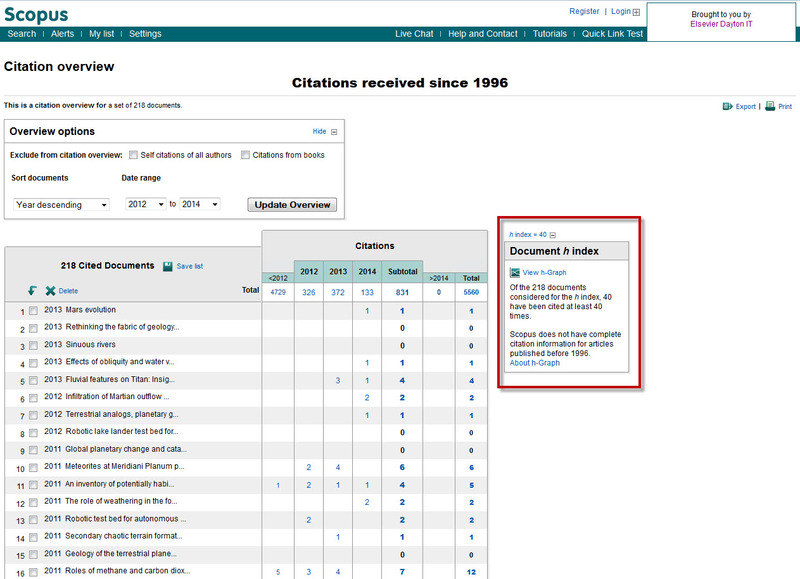 Scopus has launched a Simplified Chinese interface and help files. This development applies to the general user interface and is intended to improve the usability and teach-ability of Scopus in mainland China. The Simplified Chinese interface can be selected from the Scopus page footer and will allow users to more easily activate personalization features and alerts in their local language. Want to learn more about this release? Check out the full release notes. In conjunction with this year’s Scopus 10 year anniversary, the team embarked on a site improvement program that resulted in the launch of a more streamlined interface in February. With the overall Scopus house looking better it was time to give the Author Profile page a closer look. Newly revamped, old distractions on the Author Profile page are gone and the best tools remain. 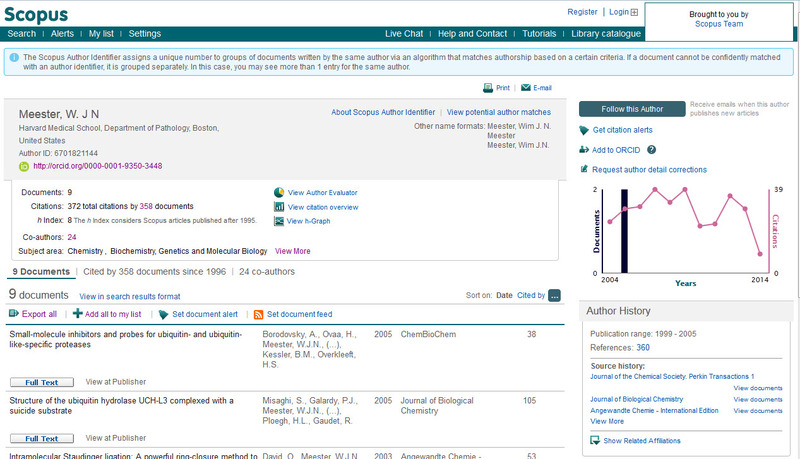 For example, if an ORCID ID is associated with a Scopus profile then a link to that ORCID will display on the author detail page. Additionally, a new graph added to the sidebar gives a quick overview of an author’s recent productivity. Best of all, users can sort “Document” and “Cited-by” lists without having to leave the author profile or reload the page. We’ve learned a lot in 10 years, especially that author’s need fewer obstacles and better tools for boosting the visibility of their work. Twice a year the independent and international Scopus Content Selection and Advisory Board (CSAB) comes together to make decisions regarding Scopus' content and content policies. Our next meeting starts Wednesday in Amsterdam and will coincide with the launch of Scopus' 10 Year celebration. Check out what I last wrote about the work they do. In addtion to the usual discussion topics: publication ethics, review processes and ongoing content projects such as the Scopus Books Expansion program and the Cited References Expansion program, Board members will get to meet more of the people who work on Scopus! From customer support to market development to the Elsevier Research Intelligence analytics team, I know that the presentations and discussions will be engaging and lively. So what is the CSAB exactly and what do they do? The Scopus Content Selection & Advisory Board is an international group of scientists, researchers and librarians who each represent a major scientific discipline.